Ford is teaming up with Hertz for the 50th anniversary of the “rent-a-racer” program that began with the classic Shelby GT350-H. Soon you will be able to rent a 2016 Shelby GT-H at select Hertz locations, which should make that business trip a bit more bearable. In 1966, you could rent a real-deal Shelby GT350 that would allow you do throw down some hot laps at a racetrack without the cost of running your own racecar. Needless to say, some GT350-H cars were returned to Hertz in less than perfect condition. The 2016 GT-H isn’t quite a race-spec model like the GT350. However, for those that sign up for the Hertz Adrenaline collection, you can rent a 5.0 GT Mustang with a bit more attitude and a lot of history. 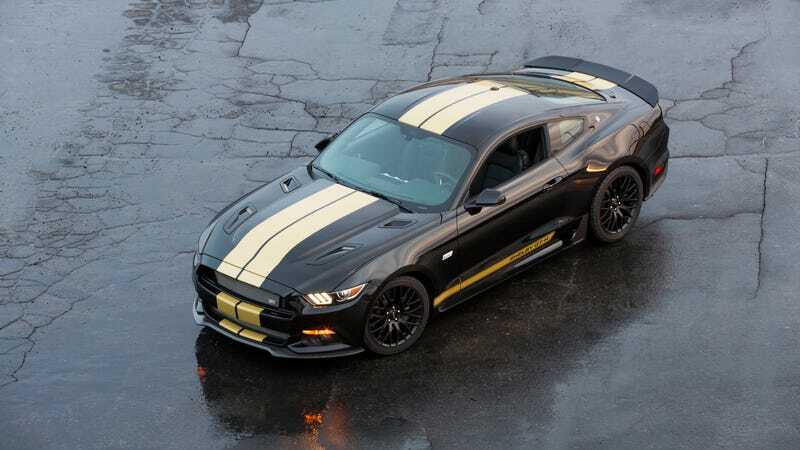 Shelby American adds the classic Hertz black and gold paint scheme on top of a more aggressive body kit that includes a vented hood, a carbon fiber front splitter, and a rear spoiler. Naturally, GT-H badges are slapped on wherever possible. In order to add more go with the show, there is a Ford Performance cat-back exhaust that should give the V8 a nice growl. Also included is a Ford Racing Handling Pack with lower springs, retuned dampers, and new sway bars. The GT-H sits on matte black 19-inch wheels with GT-H center caps and Michelin Pilot Sport all-season tires. An automatic transmission will be the only available gearbox. Shelby American is only making 140 examples and the cars will be available starting Memorial Day weekend from Hertz’s Adrenaline Collection at select airports.